Edublogs webinar overview – End of year party | E-verything! First an apology for my tardiness in posting this overview. Since the webinar my impending (and now arrived) Christmas visitors have tended to take priority. We had a great party this year – as always, and also as always it was recorded. We started as always with some chat in audio and text while people were arriving. 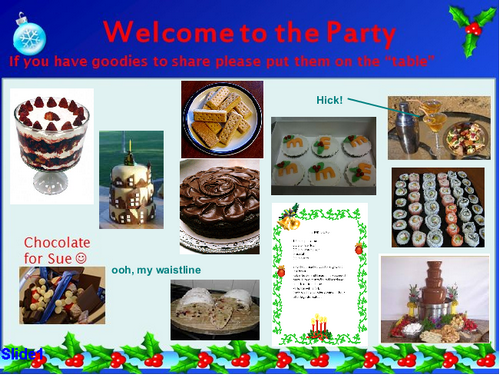 Then we moved on to the “goodies” table inviting everyone to share yummy edibles and drinkables on the whiteboard. Once we had eaten and drunk our fill (virtually of course – so no negative impacts on waistlines!) we moved on to share and play a variety of games and activities. These included: a spot the differences cartoon from Kipper and Flipper; decorating the Christmas tree; a variant of Mr Squiggle; a trivia challenge; and characterising ourselves with an image. All of these were great fun and we were enjoying ourselves so much that we over-ran! As always you will get a much better idea of how the games worked in an Elluminate context by catching the recording! This was a great session for the end of the year with everyone entering into the spirit of the party with enthusiasm. I would love feedback from anyone who has attended any of our webinars (Fine Focus or Serendipity). 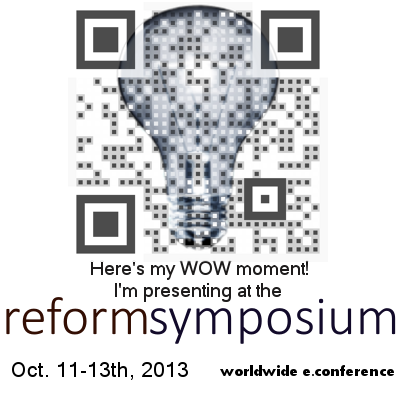 Please add your comments about past sessions, suggestions for how we can do it better and ideas for future topics! I hope to post some thoughts and reflections about this year’s webinar series at the beginning of January – once I can actually find time to reflect! We a are taking a break over the holiday, and will be back in 2011 with an Edublogs “Serendipity” session on Thursday Jan 6th at 23:00 GMT/UTC (6pm USA EST, Midnight BST) or Friday Jan 7th at 1am CEST, 7am West Aus, 10am NSW, depending on your timezone – in the usual Elluminate room. This is one of our fortnightly unconference sessions where we invite you to bring along your “hot topics” and “burning issues” for our poll on the topic of the day. If you want to propose a topic in advance then visit the Serendipity Wallwisher and add your topic. This entry was posted in Uncategorized and tagged activities, cartoons, Christmas, Elluminate, Free Online PD, games, interactive, Kipper and Flipper, party, virtual classroom, webinar, whiteboard, Xmas by johart1. Bookmark the permalink.